“Congenial hosts Gene Medlin and his wife Linda, started the business in 1985 at its present site. Gene and Linda impart real down home feeling to their restaurant. In fact, there are balloons for the little people and Gene can make balloon animals. Gene and Linda are well traveled and have eaten barbecue in a number of places. They seem to have found the right cooking methods and sauces in their journeys and have brought them to Statesville. 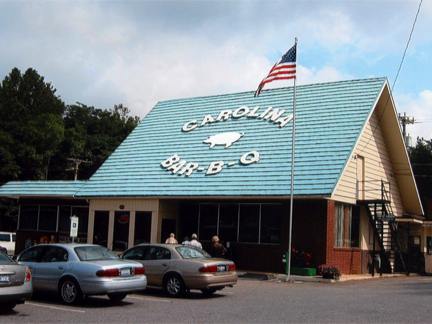 Carolina Bar-B-Q is off the interstate and has no signage on either I-77 or I-40. But in barbecue circles, word gets around to the famous and not so famous. When Charles Kuralt visited Gene and Linda, he told them how much he enjoyed their pork product but he said, “it was too refined.” Mr. Kuralt said that they need more fat and gristle. Gene told Charles Kuralt that he would save him some fat and gristle for his next visit. Excerpts from The Best Tar Heel Barbecue Manteo to Murphy page 140.